This topic contains 0 replies, has 1 voice, and was last updated by Hula Consulting 9 months, 3 weeks ago. I was pleased to see a nice delegation from South Korea represented. South Korean teas, though relatively new to the US market, offer some of the best teas and tea related products. I was fortunate enough to host a dinner sponsored by this delegation of South Korean Growers and Government Officials. If you haven’t tried South Korean teas yet, please let me know and I would be happy to send you samples of their amazing green, white, black, and oolong teas, as well as, their EXCEPTIONAL tea chocolates. On the event stage, the long awaited new book from Jane Pettigrew – “World of Tea” was officially released. I was lucky enough to get a signed copy for my library. Her book was one of the first things I reviewed upon returning home. Within the first 30 pages I found myself saying OMG and Ahhh no less than nine times. I am so excited to review this book fully. I strongly recommend EVERY tea professional purchase this book – you will not be disappointed! A very modest investment for the wealth of knowledge contained within its pages!!!! However, the second day ended somewhat on a sour note. The Networking Cocktail Reception again for the second year in a row was very poorly organized. Having only one bar for all to queue, and minimal finger foods, saw many attendees and exhibitors skipping it entirely. Which is a HUGE shame. This event used to be the star attraction of the Expo. A time for all to mingle, tell stories, share experiences, meet new people, and see old friends (you know the ones you see once a year, but it seems like you are life long friends). In the past, this event was held in awesome locations, had fun interactive experiences, and music. Every year I hear attendees complaining about this event. Hopefully the tradeshow organizers will bring this event back to what it used to be. This year I found myself not wanting to wait in an hour-long line for a drink and walked back to my hotel, the Renaissance. To my surprise, many of the attendees felt the way I did and there was a network type reception happening in the lobby and bar of the hotel. Here’s hoping that next year is better! However, not all seminars hit the mark. There were a few, noted in interviews with attendees, that might have missed it completely. The seminar on the chemical analysis of tea, spent way too much time talking about scientific theory, which we all learned in high school. Then went on to debunk the myth about decaffeinating your tea with a short infusion – which if you spent 5 minutes in the industry, you would know was hogwash. Another was the foodservice discussion panel, where to the surprise of all, a panelist said that there was no need to sell quality specialty tea to restaurants, just sell them commodity style tea bags; which of course goes against everything we as an industry are doing. Yet another, was the CBD seminar which everyone was extremely excited to attend. Though the information was not wrong, and everything said was correct; it was more of an overview of CBD and its history and legalization. I guess if you didn’t know this information it was beneficial, but easy enough to find online with a simple search. What we were all hoping for was an explanation of how we could utilize CBD in our teas to capitalize on this growing market. A discussion on dosages, how to blend, how to label, etc. is what most attendees were looking for. I encourage ALL to download the World Tea Expo app on your phones, click on each seminar your attended in the education section and take 3 minutes to fill out the survey for each seminar. It is only with this feedback that the core conference improves year over year. The third and final day is always sad for me. Getting together with tea professionals who share my passion for the industry is like a drug. Then on the last day you find yourself saying more good byes, and see you next years, than working. Suddenly, the lights go out and you’re left with the reality that it’s over. You pack your bags and head home and continue to grind it out until next year’s pick me up. Here’s to next year! May it be bigger and better as we push forward and grow the beverage we have all come to love! See you all in Vegas in June of 2019!! Disclaimer: The views and opinions expressed in this article are those of the author and do not necessarily reflect the official position of Informa, or World Tea Expo. Thoughts expressed in this article are based on attending this expo every year since its inception, and interviewing attendees and exhibitors. 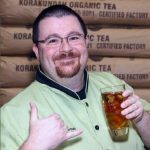 Scott Svihula is a tea expert and founder of Orlando, Fla.- based Hula Consulting, an independent tea consultancy specializing in regulatory compliance, certification support, blend development, and product sourcing. To learn more about Svihula’s business, visit http://www.HulaConsulting.com.